One of the most annoying and dangerous conditions individuals face are from the least thought-of source: eye infections. Yet approximately one million Americans visit their eye doctor’s office every year to treat an eye infection. Left untreated, these infections have serious consequences. With proper attention, however, most are small matters. Have your eyes been itchy? Red? Do you see floaters? You may very well have an eye infection. Discover more about these infections, what you might have and how to get it treated. Eye infections are normally the result of bacteria, viruses, and parasites. When these organisms enter the body, they attack it. This results in an illness, such as a cold or the flu. If these organisms attack the eye, however, an infection occurs. An infection is defined as an event in which foreign organisms enter the body and multiply, causing illnesses, diseases or other damage. These originate through a number of pathogens. Infections are not limited to one part of the eye; depending on the type, anything from the cornea to the eye’s liquid is susceptible to infection. There are five main causes of eye infections. Most infections are caused by viruses and bacteria. Viruses are infective agents that duplicate themselves within a living host. In the case of eye conditions, viruses attack the eye and multiply within its cells. Common types of viral eye infections include viral conjunctivitis and ocular herpes. Most viral infections heal on their own, but in some instances, doctors may provide antiviral eye drops or other medications to speed the healing process. Bacteria is yet another common culprit that leads to an eye infection. Bacteria are single-celled organisms that either aid or hinder bodily processes. When harmful bacteria enters the eye, it thrives and multiplies through binary fission. The result is a painful infection. Bacterial keratitis and conjunctivitis are among the most common types of bacterial eye infections. Itching, redness and swelling are associated with these infections. Parasites are also known to create infections. These small creatures live within the eye, benefiting from its host’s body. Most parasitic infections don’t present with symptoms, making them hard to identify. When symptoms do occur, individuals experience floaters, blurry vision and itchiness. Once a parasite breaches the eye’s defenses, it is imperative individuals seek medical help as serious conditions can result. Some parasitic eye infections include river blindness, crab lice, and acanthamoebiasis. Most treatments include topical or oral medications, but surgery is necessary for some cases. 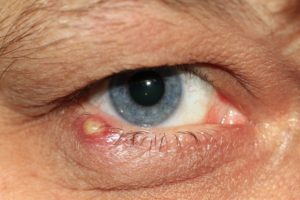 Fungal eye infections are rare but serious conditions. These occur most frequently when an injury leaves plant material in the eye. Prominent types include fungal endophthalmitis and keratitis. Fungal infections present with eye pain, soreness, redness, and blurriness. They are treated with prescribed topical and oral medications, surgery or directly-injected medicines. Itchy, watery eyes usually surmount to allergic infections. Pollen, dust, mold spores or other particles enter the eye, causing an allergic reaction. The most common type of infection is allergic conjunctivitis. Acute allergic conjunctivitis comes and goes with the seasons while chronic occurs year round. Allergic infections are treated with home, over-the-counter and prescribed remedies. Various symptoms are associated with different types of eye infections. However, most infections are linked to the same or similar symptoms. When an infection becomes serious, it results in direct damage to the eye. This translates to deterioration of an individual’s vision or even blindness. While some infections occur without any indications at all, others are noticeable. If you experience any of these signs, it’s best to speak to an experienced eye doctor. Doctors classify eye infections two ways. The first is by naming the infected part of the eye. Conjunctivitis (better known as pinkeye), for instance, affects the inner eyelid’s membrane and causes inflammation. This part of the eye is called the conjunctiva. The second way doctors classify eye infections is by determining their cause. Haemophilus influenza, for example, is a bacteria responsible for many infections of the conjunctiva in children. When you speak to your doctor, he or she will discover what is infected and what the major culprit is to determine the proper treatment. There is any number of eye infections, but we’ll discuss some of the most common below. Styes are infections that occur in the eyelid. They are similar in appearance to small bumps or pimples. Styes are caused by bacteria and clogged glands. Similar to acne, the bacteria overcompensates and results in what is known as a stye, a pimple on the eyelid. Most of the time, a stye isn’t a serious threat and will go away on its own. The abscess bursts and heals over. Individuals can treat styes themselves by using warm compresses several times a day on the infected eye. Most styes will disappear within a few days. If the stye returns, however, it’s best to speak to a doctor, as this may indicate there is another underlying condition. Pink eye, also called conjunctivitis, is usually due to bacteria or viruses that infiltrate the eye’s defenses. Individuals experience red, inflamed eyes that are itchy. A yellow discharge may also occur. Conjunctivitis is very contagious. Although it rarely causes eye damage, it’s best to treat it immediately to avoid further contamination or the possibility of damage. Doctors prescribe antibiotics for bacteria-caused pink eye, but viral conjunctivitis must simply run its course. Keratitis is infectious or noninfectious. Individuals who experience keratitis have inflamed corneas. If left untreated, this infection may damage the eye and your vision. Keratitis involves eye pain, redness, swelling, blurred vision and the feeling that something is in your eye. If you experience these symptoms, see an eye doctor immediately. When treated quickly, keratitis is rarely serious. Eyedrops and antibiotics usually treat keratitis, but severe parasite-caused keratitis may require cornea transplants. Trachoma infections are common in developing countries, most notably Africa. They are caused by bacteria and are highly contagious. According to WHO, trachoma is the world-leading cause of preventable blindness. An estimated two million people are blind as a result of this disease. Trachoma presents with itchiness and red eyes. The infection progresses slowly, with the inflammation becoming more intense. Discharge and pain, especially in the upper lid, increase. Children are especially susceptible. Without proper attention, trachoma can lead to blindness. Dacryocystitis is prevalent among infants, but individuals above 40 have a higher chance of experiencing this eye infection. It is caused by a block in the tear duct, which infects the tear sacs. Anything from bacteria to sinusitis may disrupt the usual processes in this area, leading to a blockage. Dacryocystitis involves pain in the outside corner of the eyelid, discharge, swelling, and fever. Acute dacryocystitis is treated with oral antibiotics or steroid eyedrops. Treatment depends on the pathogen causing the infection. Mild infections, such as sties, can be treated at home. Many times, however, other forms of medication are required. Serious conditions might require whole-body medications in order to rid patients of the pathogens or surgery. It’s common to experience an infected eye at some point in your life. Most of the time, these situations are mild infections. Don’t forget that red eyes do not equate to an infection. The first thing an individual should do is assess the situation. Keep track of your symptoms and take note of how long you have experienced them. If the symptoms began within the past 24 hours, take note of them throughout the day and attempt to alleviate eye pain through warm compresses. Do some light research so you have an indication of what might be causing the problem. Stop at a local drugstore to see if an over-the-counter medication is available. If you injured your eye or experience intense pain, go to the emergency room. Regardless of whether your infection is contagious or not, it’s always best to practice good hygiene. Doing so may help clear up the issue, alleviate any uncomfortable symptoms and avoid spreading the infection to others. If your symptoms do not clear up or get better within 48 hours, contact your eye doctor. If this is the case, you may have an infection that requires prescribed medication. Even if the infection is a mild one, it’s best not to risk your eyesight. At your appointment, the doctor will examine your eye. Sometimes, physicians take samples from the eye to cultivate them and determine the pathogen at work. Once the culprit and location of the infection are identified, your doctor prescribes appropriate medication to solve the problem. There are a number of actions individuals can take to decrease their chances of obtaining an eye infection. Going to the optometrist or ophthalmologist yearly for checkups is the best way to ensure your eyes are in tip-top shape. Most viral infections clear themselves out. Much like catching a common cold, however, there are measurements one can take to avoid viral eye infections. Strengthening the immune system and steering clear of ill individuals are the best ways to decrease the likelihood of viral and bacterial infections. By keeping your body healthy and minimizing the risk of catching a virus or pathogen from someone else, you increase the chances of staying healthy. Washing hands is one of the greatest defenses against these infections. Carry hand sanitizer with you for public outings and, if you work with the public, keep your working space clean. Sanitizer wipes are handy for this. Teaching children good hygiene is also essential, as bacteria spreads quickly with one unprotected wipe of the nose. If someone at home has an infection, it’s best to wash their bedding every day until the illness clears. In addition, give the family member his or her own towels and other items for personal hygiene. Do not share those items with any other family member. Insect bites also cause parasitic eye infections. If you travel, know the signs of infection and the possible parasites transmitted through local bugs. Take preventative measures to avoid being bitten, including using bug spray and nets. Likewise, eating raw or undercooked meat leads to infections. To avoid this possibility, eat cooked food. Finally, avoid cleaning contact lenses with tap water, which may contain parasites. Use only approved solutions to clean your contacts. Unfortunately, there is not much individuals can do to prevent fungal infections. While rare, fungal infections are most commonly caused by plant particles getting into the eye. To avoid this, pay careful attention when walking through densely populated areas, such as forests, and consider protective eye gear, such as sunglasses. Allergies vary with the person, but many individuals experience infections as a result of mold spores, dust and pollen. If you identify the particle causing the allergy, individuals can take steps to avoid future contact. This might involve closing doors or windows, reducing outside exposure during certain seasons or intense cleaning at home. Once contact with the allergen is removed, chances of infection decrease. Those who wear contacts should pay careful attention to directions. Frequently, infections occur because of improper handling of contacts. Eye infections are painful experiences. If you are experiencing a symptom associated with an eye infection, we have knowledgable professionals who will help. Request an appointment by filling out our online form. You deserve to have healthy eyes. Let’s wipe away any infections so you can see clearly.